Twilight At Royal Pines Resort. I have noticed over the last decade, the idea of the traditional wedding gown has changed. There is so much more freedom in choice of venue and style of dress, for the modern-day bride; it is so exciting! There is a wide range of venue options: from the Byron Bay ‘Boho’ style, to the beautiful lush green gardens of Mount Tamborine, to the historical Brisbane traditional city church feel. With current trends, brides marrying later in life, seem to have a simpler approach, with a modern, slim-fitting and elegant look. 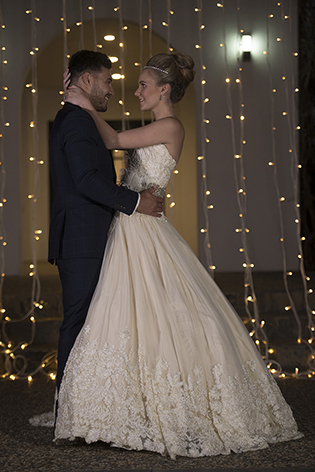 They seem to prefer an evening or cocktail style dresses, rather than the traditional, classical wedding dress designs. Tradition has had to adapt to our modern-day brides and today’s lifestyles. A generation ago, women were getting married much younger with different demands and priorities. The dresses showcased in front of the Royal Pines Chapel, at twilight, highlight a traditional silhouette with a modern twist. THANK YOU TO ALL THE VENDORS BELOW FOR A JOB WELL DONE! Thank you Nandie and Matt for these dreamy images. 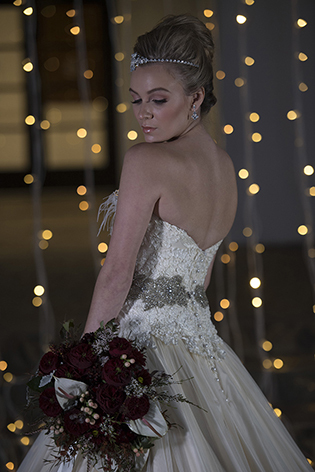 Newer PostHelena Couture Designs Scores 100% In Positive Reviews From Easy Weddings.